Fashion is a tough business whether you’re running a multi-billion-dollar brand, or selling product on Etsy. And even though being a fashion designer is every little girl’s dream job, it takes some serious drive, passion, and hard work to actually make it happen. When we’re shopping online and filling our virtual carts with as much cute, cheap clothing our credit cards can handle, we rarely think about where it all really comes from. When we heard about INLAND, a Toronto-based fashion event all about supporting Canadian fashion designers and shopping locally, we couldn’t wait to check it out! We love how this event introduces Canadian fashionistas to new fashion and accessory designers, while giving the designers an opportunity to gain exposure and promote their brands. From jewelry and accessories, to dresses and lingerie, INLAND has a little bit of everything. After spending some time browsing the booths, it’s safe to say we were blown away by the talent and creativity of these local designers. Starting a business is anything but easy. 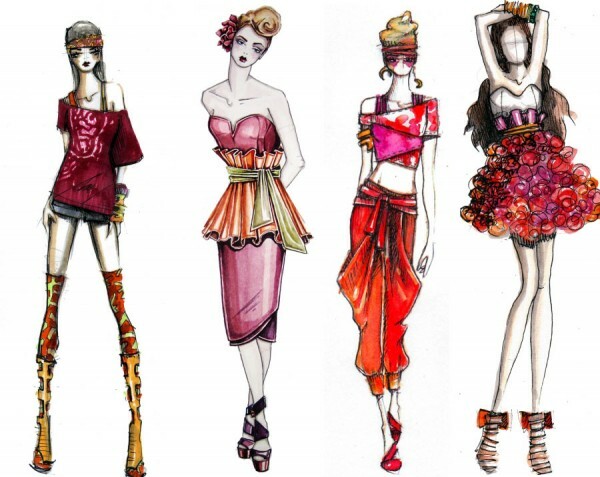 Finding success as a fashion designer takes dedication, determination, and a lot of hard work. When you’re working long hours, making little money, and constantly facing rejection; it’s the love and passion you have for your craft that will motivate you to work even harder. You need to be prepared to eat, sleep, and breathe fashion 24/7! Volunteering, interning, and working behind the scenes will teach you more than you realize. Take every opportunity you can to experience something new. Gain valuable insight from those in the industry and learn from their successes, as well as their failures. Meet people, make connections, and make a name for yourself. You never know who could help launch your line in the future! Creative expression is one of the most important elements of design. Your creativity is what will make your line unique, and ultimately what drives your passion for design. However, when you are trying to start a business, you need to be practical. All of the designers emphasize the importance of working with your resources. They recommend starting the creative process by sourcing affordable materials and supplies, and then drawing inspiration from what is available to you. People will tell you that following your dreams is a fantasy, but always remember that you have the power to prove them wrong. It won’t be easy, but if you are truly passionate about what you are doing there’s no limit to how far you can go. Even with all the time, sacrifice, and love that goes into starting your own business, the designers assure us that it’s all worth it when you see someone fall in love with one of your designs. Do you dream of someday designing your own line?